The shutter-speed regulates the exposure. The longer the 'eye' is open, the more light gets in. So let's just put it wide open and to very sensitive, that should work right? wrong. With the Aperture we can limit the range in which the image is sharp (depth-of-field). The minimum and maximum aperture values you can use depend on your lens. Generally the higher the aperture the more expensive the lens will be. Imagine a person standing in front of a house. For portraits, photographers want to put the focus on a single person (shallow depth-of-field) - which means they prefer a large F-stop value. Your camera probably has a portrait-mode, in which it tries to do exactly this. 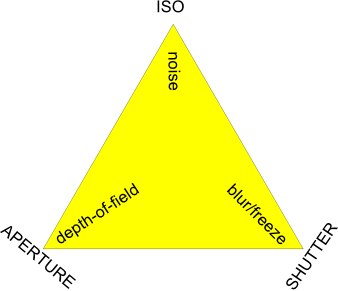 With shutter speed, we'll be able to get either a 'blurred' or a 'frozen' image. with a fast shutter speed (e.g. 1/4000 second) it will appear to be standing completely still. Your camera probably has a sports mode, in which it tries to freeze the action using a fast shutter-time. In general, we want it to be as low as possible (100, 200, 400) since larger ISO-values cause pictures with noise. Unfortunately this cannot always be avoided. The below overview gives you an impression of what ISO-value to set. or if it's too bright, we can do the opposite. Prime lenses have a fixed focal length. 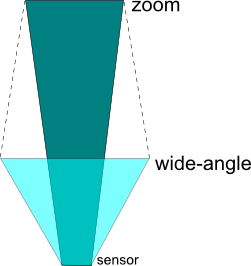 Zoom lenses have a variable focal lenght. Smaller numbers mean a bigger field-of-view angle (good for landscapes) while larger numbers mean a small field-of-view (good for getting far-away object closer). The cheaper zoom lenses have F-stop values with a different F-value for the minimum and maximum focal lenght The more expensive ones go to F/2.8 and can have a fixed value over the entire focal length. Now there is one thing to keep in mind - the minimum and maximum focal lenghts are given for full-frame camera's (the really expensive professional ones). The (pro)sumer models usually have a so called 'crop-factor'. For example the canon 550D has a cropfactor of 1.6. The below diagram shows what happens if you zoom between minimum and maximum focal lenght. Imagine the light-blue figure being your wide viewing angle. When zooming it moves towards the darker figure - and as such your angle gets smaller while at the same time increasing your 'range'. The light-blue figure shows the minimum focal length and gives a wide angle. The dark-blue figure shows the maximum focal lenght and gives a small angle. The dashed lines show the in-between focal lenghts. IS only helps countering your own motion - it essentially improves handheld images shot at slow shutter speeds. If you have a blurry image, and the foreground and background have the same level or blurr then your image was blurred due to camera-shake. IS does little to help you capture motion (i.e. to freeze a moving object like wildlife, sports - without having motion blur). In this case a fast lens ( large aperture ) is the only way to freeze the speed, besides increasing the ISO sensitivity. Motion-blur causes only a (small) part of the image to be blurry (e.g. while making a picture of a landscape, someone walks sideways through the shot) By tracking the subject with your camera (i.e. keeping the car in the same spot, relative to the camera's viewpoint) you can keep the subject sharp while blurring the background. Remote triggering of Canon speedlite's with the Canon ST-E2. In general. flash (especially on-camera flash) has a very limited range. People photographing at concerts with flash (with the artist 30+ meters away) are - besides creating a lightshow - mostly wasting battery life.